Thank you very much for your letter and for all the enthusiasm you show for Simple Minds. I am glad to know Chrissie Eldridge was so helpful when we were with Arista. As Virgin will have told you we still have no new publicity material but are in the process of getting some done, obviously with a view to the release of the new album. I think you will love the new album as there has been more emphasis on the bass and drum sound and Derek is in particular in good form. Unfortunately, as I said before there is no new publicity material Martin, but hopefully there will be lots of goodies at the time the new album comes out. The band have in fact recorded two albums and for a limited period we will be selling them both together at a special price. Thereafter, they will be sold separately. The second album not being available until October. We will also be issuing with the albums lyric sheets which will also include lyrics for The American. 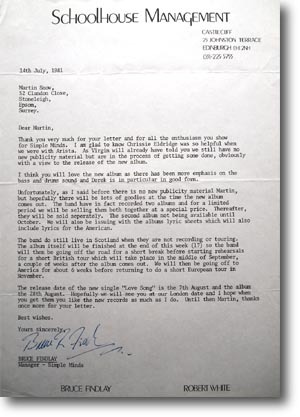 The band do still live in Scotland when they are not recording or touring. The album itself will be finished at the end of this week (17) so the band will then be going off the road for a short break before starting rehearsals for a short British tour which will take place in the middle of September, a couple of weeks after the album comes out. We will then be going off to America for about 6 weeks before returning to do a short European tour in November. The release date of the new single Love Song is the 7th August and the album is the 28th August. Hopefully we will see you at our London date and I hope when you get them you like the new records as much as I do. Until then Martin, thanks once more for the letter.